You’ve probably seen or heard the adverts for Amazon Echo. It’s the smart speaker from Amazon that enables you to do all sorts of things in your home simply by speaking commands into Alexa, the voice-controlled personal assistant service. But what you probably didn’t know is that you can now get betting tips and news from Paddy Power through Alexa! That’s right: the Irish betting giant has become the first bookmaker to launch what’s known as a ‘skill’ on the smart device. You can think of skills as the equivalent of apps on a smartphone or tablet – they’re basically the things the device can do. You can add skills to give your Echo greater functionality, such as translating sentences from foreign languages, ordering takeaway or playing games. Paddy Power is one of hundreds of companies embracing voice technology and launching its own skill, but it’s the first in the betting industry to do so. You might be wondering what a betting company would have to do with voice technology. Paddy Power’s ‘Flash Briefing’ skill provides a brief bulletin featuring sports news, results and betting tips. And of course, it’s read out by an Irishman rather than the standard voice. Paddy Power’s product innovation manager, Stephen McMeel, spoke at the recent Festival of Marketing about the company’s experience of creating an Alexa skill. He explained that it had previously always 'designed for the transaction' i.e. the aim was to make it easier for the user to place a bet, which ultimately is its desired result. However, after a failed experiment with the Apple Watch, Paddy Power realised that it needed to come up with a different approach when it came to voice technology, with more focus on content rather than transaction. Gambling in Ireland tends to be a personal, private activity and most punters probably don’t want Alexa reading out their wagers – or winnings – when their family or friends are around. That’s why the firm has concentrated on providing relevant content like sports news and betting tips with its new skill on the smart home device. And in typical Paddy Power fashion, it has put a humorous spin on it, with quirky and comical news stories included among the serious ones. "Of course, using your voice to interact with technology is nothing new. Apple’s Siri has been around for more than five years – but people are generally too self-conscious to stroll around in public while barking orders into their smartphone. Those clever sausages at Amazon have realised this, and are betting that people will feel more liberated when using devices within the comfort of their own homes – where strangers and neighbours can’t witness their deviant tendencies. I’m certainly a convert. Being able to set a timer with just your voice, when your hands are covered in raw chicken, is surprisingly satisfying." For now, Paddy Power is taking feedback from users and from journalists who took part in a month-long trial of the skill as part of its launch. The company plans to bring out an updated skill in early 2018 based on this feedback. 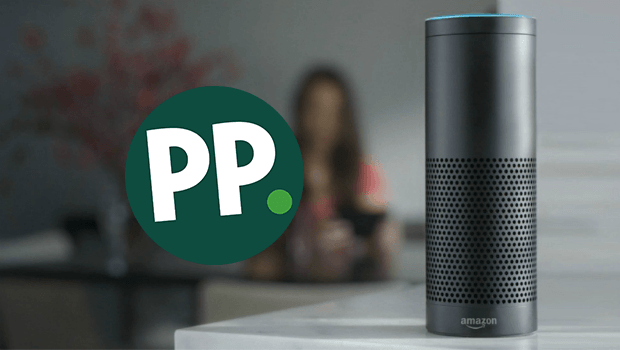 Paddy Power is renowned as a distinctive brand that likes to push the boundaries, and it is certainly showing innovation by being the first bookmaker to launch a skill on Amazon Echo. Whether other betting companies jump on the bandwagon is likely to depend on how popular the device proves to be, and the reaction to Paddy Power’s own skill. Voice technology is still in its early stages, and it’s too soon to say whether it’s just a fad or something that’s going to revolutionise how people interact with tech in their homes. For the betting industry, it certainly presents opportunities!